, and we’re excited to start connecting with you in new ways via Google+. On our new page, you’ll find AdSense updates and tips, and you’ll have access to exclusive Hangouts with members of the AdSense team. These live video chat sessions will give you the opportunity to share your product feedback with our Product Managers, ask your questions to our optimization specialists, and get to know many others who work on AdSense. We hope that through these Hangouts on our page, you’ll also have the chance to meet other AdSense publishers from around the world to share your experiences and best practices. Be sure to follow us on Google+ today and join the conversation! We’ve just launched our official AdSense Google+ page, and we’re excited to start connecting with you in new ways via Google+.
. We have a lot of information to share, so we've decided to create this new blog format as a one-stop shop for all the information both publishers and advertisers need, including AdSense and AdWords information. In order to subscribe to only AdSense topics simply visit the blog, and under "Subscribe to a label" on the left hand side, select the category “AdSense”. Then, you'll only get alerts for posts categorized under that label. If you click "Subscribe via email" (also on the left hand side) you will subscribe to the entire blog (i.e. all labels). Subscribe to the new blog today! We've heard from many of you that a blog in Hebrew would be very useful. With this in mind, we're excited to announce the launch of the Google Israel for Businesses blog. We have a lot of information to share, so we've decided to create this new blog format as a one-stop shop for all the information both publishers and advertisers need, including AdSense and AdWords information. AdSense in Your City began in the Summer of 2010 with the goal of allowing the AdSense Optimization team to meet with more of our AdSense publishers, offer customized tips and recommendations, and collect feedback. To date, we’ve worked with nearly 1500 publishers in more than 30 cities. Each AdSense in Your City event includes presentations on optimization tips, DoubleClick for Publishers Small Business, and our mobile offering. Publishers who attend also receive a one-on-one consultation with a member of the AdSense team to review their site and offer customized recommendations. The events also provide a great opportunity for our attendees to meet and network with other AdSense publishers. 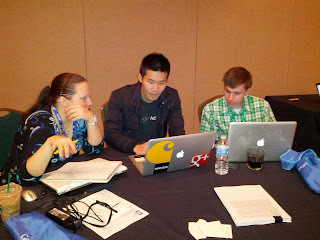 If you’re interested in attending an AdSense in Your City event, let us know. We’ll be sending out invitations soon so make sure your AdSense account is opted in to Special Offers so we can reach you. Also, if you’re not near one of our North American cities, don’t worry, AdSense in Your City is now global!
. It’ll give you more control over your ads and make it easier than ever to manage the ads showing on your pages. The new Ad review center will show you ads of all targeting types (contextual, interest-based, and placement) that have appeared on your pages, and allow you to review them. With placement-targeted ads, you can still review them before they show up on your site. And now, rather than grouping ads together, you can make decisions on individual ads to control what appears on your site at a granular level. We’ve also made the Ad review center easier to use. When you’re reviewing ads, we’ll now first show you the ads that are getting the highest number of impressions on your pages -- or, if you’re holding placement-targeted ads for review, we’ll first show you those that are likely to get the highest number of impressions on your pages. Ads that don’t receive or likely won’t receive any impressions on your sites won’t appear in the tool. As a result, you’ll save time and be able to focus your efforts on reviewing only the ads that your users may see. In the new Ad review center, you can simply click on an ad to block it. To block multiple ads, highlight and drag the ads to block them all at once. We’ve also provided a magnified view when you hover your mouse over an ad, as well as the option to see an ad in full size, as we know that it can be difficult to see details in ad thumbnails. Ready to use the new Ad review center? If you’ve used the Ad review center in the past, the new version will be available in your account in the next few days. If you haven’t yet enabled this feature yet, visit the Allow & block ads tab to get started. Please note that this feature isn’t compatible with Internet Explorer 7 or earlier -- visit our supported browsers page for more information. For placement-targeted ads, we recommend keeping your review preference set to the default of 'Run ads immediately' and then reviewing them after they’ve started running. This is because ads don't participate in the auction while they’re held for review, which could potentially lower the winning bids and as a result, your overall AdSense earnings. For more information, visit our Help Center. Over the next few weeks, we’ll be bringing you more updates to the Ad review center -- so stay tuned! Feel free to leave us a comment with your thoughts and feedback in the meantime. Whether it’s via blog comments, forum threads, or in-person events, we’ve heard your feedback about AdSense ad controls and the enhancements you’d like to see. With that in mind, today we’re thrilled to announce that we’re rolling out an entirely new version of the Ad review center. It’ll give you more control over your ads and make it easier than ever to manage the ads showing on your pages. , we’ve launched a new series of Help Desk Hangouts On Air to put you in touch with teams who can help you get the most out of our products and features. Is there a threat in respect to data privacy? We take privacy very seriously at Google. The only person who has access to your Google Analytics data is you. You can also grant other people access to your Analytics data, but that’s up to you. Is there a plan to update the administration part of GA? We need more levels: creator, administrator, manager, reader. Excellent feature request, and it relates to the question above. We get this question often and know that the current model is limiting. We are working hard to figure out the best user model for Analytics. Is there a good WordPress plug-in for adding GA code to a blog? Plug-ins! Justin’s favorite, we learned yesterday in the Hangout. There are some great ones out there, especially for WordPress. Check out Google Analytics for WordPress. Can you tell us more about the benefits of using Analytics for tracking mobile apps? Great question. You can absolutely track apps with Google Analytics. We have two SDKs, one for Android and one for iOS, that make it easy to track how people use an app. If you’re going to use GA to track apps you should also understand Event Tracking and Custom Variables. These two features are very useful when tracking apps. 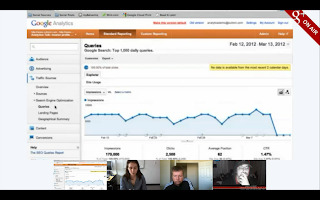 Justin shows us a feature that tells you how often you show up in Google’s organic search results and the number of clickthroughs that you get. 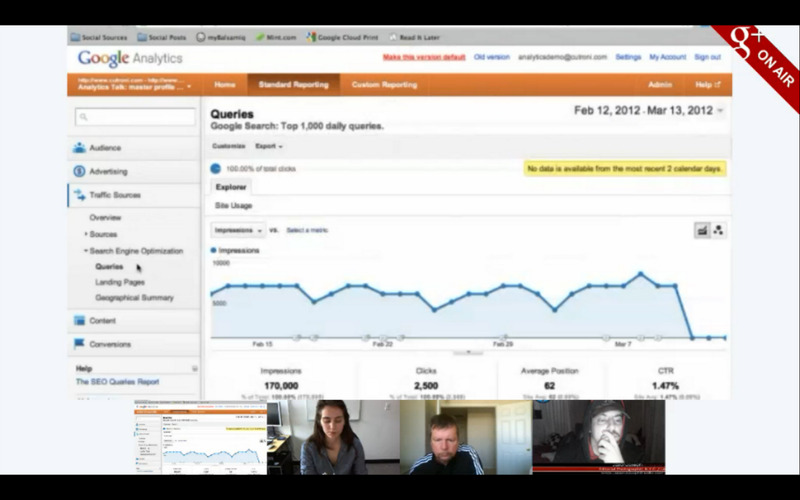 To learn more about how to get started with Google Analytics, visit our Help Center. And remember to tune in to the live stream of our next Hangout at 11 a.m. PDT Wednesday, as we discuss how to use Hangouts (something a bunch of you have asked us to talk about!). We’ll be collecting your Hangout questions today on the Google+ Your Business page. You’re looking to grow your business, and we offer a ton of tools to help you do just that. But sometimes, you might need a little help learning all the options and getting started. That’s why this week on the Google+ Your Business page, we’ve launched a new series of Help Desk Hangouts On Air to put you in touch with teams who can help you get the most out of our products and features. team! Since January, we’ve met with over 500 publishers across the U.S. and Canada. To date, the AdSense in Your City team has met with close to 1500 publishers in more than 30 cities and we can’t wait to host more events. We’ve had a great time working with our AdSense publishers and sharing our optimization tips and best practices for AdSense, DoubleClick for Publishers Small Business (DFP SB) and Mobile. It’s also great to see so many of our publishers networking with one another and making friendships. One publisher in Albuquerque excitedly told me, “This is the first time I’ve been in a room where everyone knows what AdSense is!” We hope that we can continue to provide forums for our publishers to get together and share their stories and insights. From snowy days in Portland, OR and Victoria, BC to a visit to the “Music City” in Nashville, TN, the team has brought back wonderful AdSense success stories and feedback. A publisher from Oregon, who attended our Las Vegas event in November, was snowed in during the Portland event but came to Albuquerque to meet with us again. After implementing our tips from Las Vegas, the publisher saw a revenue increase by 40%. We appreciate all of our publishers who have taken the time to attend our events, especially those who have traveled great distances to meet with us. Our team is looking forward to continuing to meet with even more of our amazing publishers. We’ll be announcing our next 15 cities soon, so stay on the lookout for our next update. If you want the AdSense in Your City team to come to your city, let us know by adding your North American city in the comments section below. Recent months have been busy and exciting for the AdSense in Your City team! Since January, we’ve met with over 500 publishers across the U.S. and Canada. To date, the AdSense in Your City team has met with close to 1500 publishers in more than 30 cities and we can’t wait to host more events. publisher, now is a good time to join and earn additional revenue from your website. Over 40 promotions will be available exclusively to Google Affiliate Network publishers from Friday, March 23 through Monday, March 26. As a publisher, you’ll earn a performance fee from orders that originate from your links. You can view all exclusive promotions on this blog post. How do I post these promotions on my site? To access any of these exclusive promotions, you need to be an approved publisher in Google Affiliate Network. Once approved, review the promotions available and click the "Apply Now" link for each one that you wish to promote. 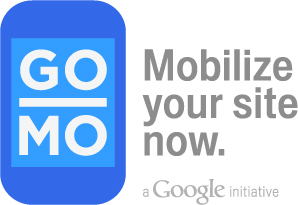 Tracking links will be available in your Google Affiliate Network account by viewing the Home tab on March 19th. You can also search for “March Exclusive” links in the Links tab on March 23rd. Need help applying or want more information? Review the Publisher Beginner’s guide today. All promotions will be available starting midnight Central Time on March 23rd, and all will expire at midnight Central Time on March 26th. Please remember that you may not post any of these exclusive promotions until March 23rd. If you aren’t already a Google Affiliate Network publisher, now is a good time to join and earn additional revenue from your website. Over 40 promotions will be available exclusively to Google Affiliate Network publishers from Friday, March 23 through Monday, March 26. As a publisher, you’ll earn a performance fee from orders that originate from your links. You can view all exclusive promotions on this blog post. , there are many ways publishers can optimize their site for AdSense. One of the most overlooked is ensuring that our AdSense crawler can accurately crawl your site so that your ads are as relevant and useful as possible. Today we're making this task easier for you with our latest redesign of the crawler access page which you’ll find on the Account Settings page of your AdSense account. Provide accurate and actionable information about your crawler errors. Organize and display the information in a more readable way. Provide clear and concise steps to help you fix the errors. Keeping the information that pertains to you and removing everything else. Incorporating expandable sections so information isn’t overbearing and indigestible. Adding a new column which shows how many failed crawl requests occurred over a period of time. This gives you an idea of the magnitude of the error. Adding a new ‘How to fix’ column specifically designed to help you solve the error. This AdSense redesign is merely a first step toward empowering you with the most accurate and relevant information. This in turn allows for better decision making which can lead to more effective AdSense optimizations, and as a result, increased revenue. As we explained in a previous post, there are many ways publishers can optimize their site for AdSense. One of the most overlooked is ensuring that our AdSense crawler can accurately crawl your site so that your ads are as relevant and useful as possible. and Pt. 2: Use the right product for more tips on avoiding invalid clicks and maintaining a healthy user experience. Let’s start with a quick recap on why it’s important to follow these policies to minimize accidental clicks. First off, in order to protect our network from artificially inflated costs, we carefully monitor clicks and impressions on Google ads. Invalid activity that we detect will be deducted from revenue at the end of the month and in some cases, may eventually lead to a disabled account in which the earnings will be returned to the affected advertisers. Also, with smart pricing, high numbers of accidental clicks will decrease publisher revenue in the long-run. This is because accidental clicks don’t result in conversions for advertisers, which will in turn reduce the amount that they’re willing to pay to show ads on your site. Interstitial ad pages: Game play buttons shouldn’t lead to interstitial pages dominated by AdSense for content ad units with no obvious game play links. More generally, links intended to navigate the user to game play pages shouldn’t deceive the user into clicking AdSense ads. Please visit our Help Center for more information on placing AdSense ads on interstitial pages. Inconspicuous play buttons: Game play buttons should be clickable and placed in an obvious location. To minimize user confusion, indicate how to play the game through text and image. Ad units shouldn’t surround game play links too closely. Please visit our Help Center to view the full policy regarding deceptive AdSense implementation. For a full description of the above two policies and to review example ad implementations, please visit our Help Center. Following these guidelines will help you avoid accidental clicks and provide an optimal user experience. Today we’re sharing our tips and best practices for placing AdSense for content ads on game play pages in a way that doesn’t confuse the user and create invalid click activity. If you run a site with online games, a game play page refers to the page where an individual game is described and a user can click to begin playing. Make sure to also visit Pt. 1: Keeping the right distance and Pt. 2: Use the right product for more tips on avoiding invalid clicks and maintaining a healthy user experience. to learn about basic features of the new platform. Join the conversation and discuss this post in our revamped AdSense Forum! We hope that by now you've found the AdSense Help Forum to be the best place to ask questions, search for answers and share tips with other AdSense publishers. We've been listening to your feedback about forum features you'd like to see, and we're excited to announce that we’ve moved the AdSense Forum (together with all its content, users and user levels) to a brand new solution: Google Product Forums. The new Google Product Forums platform, which is built on Google Groups, offers members of the AdSense Community improved search across the forum, Help Center and the blog. At the same time, the most important features of our current forum, like levels and marking a Best Answer, will continue to be available in the new forum. Additionally, your browser bookmarks and links to the content in the old forum will still work, as you’ll automatically be redirected to the new one. Google Product Forums also includes some new features that you've told us you'd like to see. For example, you’ll be able to add a “Me too!” vote to a question to quickly share that you’re interested in the question. You’ll also be able to +1 your favorite topics. We hope you’ll enjoy the modern look and feel of the new forum. Visit the Getting Started Guide to learn about basic features of the new platform. Husband and wife team Tim and Victoria van Brugge run i-do.com.au, an Australian wedding directory. Their original business plan was to sell diamonds online, but in creating the wedding directory to build an audience of potential customers they discovered that media and advertising was an easier business model, and they've never looked back. Recently we sat down with Victoria and Tim to learn about how they use AdSense on their website. Watch this video to learn more.